In War Horse, the animal’s improbable survival is threaded through human-interest stories. There is a hellish episode in War Horse. The English stallion Joey, having endured over three years of the First World War after being hauled into it by a foolishly hopeful young cavalry officer, finally panics. Running through the trench lines, he flips flat onto his back and gets entangled in barbed wire like a trussed turkey. It is terrifying, and it also nakedly reveals the craziness of Steven Spielberg’s attempt to make us feel the nightmare of the war by fixating our empathy on a horse. Shortly before the war in 1914, Joey bonded to a gentle English farm boy, Albert (Jeremy Irvine). Spielberg films the land like MGM’s old dream of thatched and downy England, yet the script rumbles with foreshadowing. Joey and Albert try to save the family farm from a greedy landlord (David Thewlis) because Albert’s dad (Peter Mullen) is a partly lame alcoholic and his mom (Emily Watson) is a noble drudge. As the fast, lean, elegant beast plows a sloping, rocky field, the muddy furrows suggest, of course, the trenches of the coming slaughter. For a while, military scenes try to maintain the lush, moody beauty of earlier pastoral sequences. Joey looks heroic as a cavalry steed, and his proud new owner (Tom Hiddleston) takes him into battle as if expecting a better Charge of the Light Brigade. Then the Germans (those devilish Huns!) bring out the machine guns. Having given us the old Errol Flynn rush, Spielberg shows some modern slaughter. But we don’t see the horses being mauled, mutilated, and dying — in the pictorial aftermath, they form a pretty carpet of corpses. War Horse is amazingly short of blood. The horse’s improbable survival is threaded through human-interest stories. A sweet, orphaned girl makes Joey her first ride, and German brothers cherish him for a while. Two writers carved this soap from Michael Morpurgo’s book, a kid-fiction novel that became an acclaimed stage play. He was first inspired by a local mare and by meeting a WWI veteran (around a million British horses died in the war). Joey, played by several animals, is a stirring steed. But positive comparison to Black Beauty or My Friend Flicka falter rather quickly, and War Horse never comes close to The Black Stallion, which might be called the great Spielberg horse movie not made by Spielberg (in fact, by Carroll Ballard). In a trench assault, Spielberg tries to rival his D-Day landing in Saving Private Ryan. He fails. Stanley Kubrick did WWI combat better over half a century ago in Paths of Glory, and so did Lewis Milestone a quarter-century before that in All Quiet on the Western Front. But War Horse is pitched to an audience that would consider those marvels to be cave paintings. A very knowing moviemaker, Spielberg relies a great deal on the ignorance of his viewers. He has also become a numbingly predictable director, without the inventive flash and fun of his early work (or his best war film, Empire of the Sun). The ’70s wonder boy has gotten rich and more acclaimed but has not matured well as an artist. War Horse is an absurdly picturesque load of mud, corn, and horse manure. It is not really for kids, or adults, or horse lovers, or even war haters, so what’s the point? Cameron Crowe’s We Bought a Zoo is one of those movies cleverly designed to turn critics into predators. With fangs bared, the reviewer snarks something such as, “This is We Bought a Zoo and Stepped in a Soft Pile.” Having written that, I admit that the animals are enjoyable, and the two young humans are pretty much the ultimate snookums of adorableness. 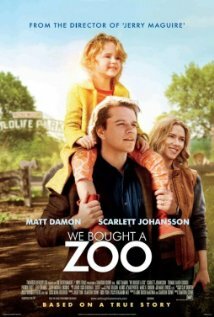 One of them is Lily, who works at the small, rural zoo recently bought by former print-journalist Benjamin Mee (Matt Damon). Lily is acted by Elle Fanning, who has shot up in adolescence and towers over Benjamin’s teen son Dylan (Colin Ford). She moons for Dylan, and whenever she unleashes her radiant smile, the movie moons for her. The camera has a parallel crush on little Maggie Elizabeth Jones as Ben’s daughter Rosie, the mascot of goo-goo goodness, like the celestial love child of Walt Disney and Shirley Temple (sorry if that image is a bit uncomfortable). Ben sinks his money into the zoo, hoping that will overcome his and the kids’ anguish about their late wife/mom. He even bonds emotionally with an aging, dying tiger. Zookeeper Kelly (Scarlett Johansson, looking fresh from a safari) tells him it is time to let the old cat go. Very soon, Kelly will be the best therapy of all, and Lily will help Dylan heal, while darling Rosie scampers about as if staging her very own Dr. Dolittle. Matt Damon is an appealing Ben. Infallibly funny Thomas Haden Church (Sideways) is his skeptical brother. The zoo crew charms, including Patrick Fugit, once the boy star of Crowe’s Almost Famous (a former San Diegan, Crowe includes S.D. references, though the film was shot in the L.A. area). A gifted and guiltless manipulator, Crowe alternates shots of swell kids and animals with heartfelt memories of the late wife (Stephanie Szostak), who looks like a Breck Girl shampooed in heaven. As Ben’s cloying nostalgia for her merges with tender love of the dying tiger, it becomes dificult for us to smile, chuckle, weep, and barf all at once. While short on fun for a family film, this could provide holiday escape for viewers eager to flee 3-D and CGI and super heroes and violence and war horses. The movie is based on the memoir of Benjamin Mee, an English journalist turned zookeeper who was the subject of a British TV documentary. His story has gone to California for lush infusions of sunshine, plugs for chain stores, and greeting-card sentiments sincerely delivered. For all of its soft slushiness of tender grief and healing, I had dark thoughts of the movie being tracked, sniffed, and eaten by Werner Herzog’s Grizzly Man. Branding Pariah as a coming-out film is too simple, if not wrong. Yes, Alike (Adepero Oduye) is secretly finding her gay identity. She is a bright, shy girl, 17, who writes poetry and dresses boyishly (shirts, caps) and has a very feminine smile. She seeks her niche among classmates (bi, straight, lesbian), and she sneaks off with a bold friend to a new Brooklyn dance club for gay, mostly black women. It is a place that her father, a cop, considers a cesspool. Dad (the reliably excellent Charles Parnell) must guard his macho standing. He brings some New York street swagger into the home, while trying to remain sensitive. A reflexive (not ideological) homophobe, he is tired of his devoutly Christian wife (Kim Wayans) pressing him about Alike and so much else. A younger sister looks up to Alike but also likes ragging on her. A stylish new chum (Aasha Davis) shows some courage in this insecure, confining world. “A person could go crazy in this dump,” Susan Kane laments in Citizen Kane, and in a claustrophobic brownstone, Pariah makes a similar point. The debut feature of writer-director Dee Rees covers familiar ground with conviction. Like so many black-family films (and many gay-themed films), it relies on tightly laced ensemble strength. Maybe it is Rees’s love of her excellent cast, and her relative inexperience, that left her hooked on medium closeups and a nudging music track. But what happens to Alike and those around her is moving and worth attention. Pariah is a good way to start 2012, and it opens January 6. Reviewed in the movie capsules: The Darkest Hour. Dec. 28, 2011 @ 2:13 p.m. Finally a movie reviewer that saw War Horse the same way I did. A good movie, maybe, but the brutality was unbarable. We dont need to relive WWI through the eyes of a horse. Dec. 28, 2011 @ 4:47 p.m.
Blakely, Thanks for reading and writing. No, "War Horse" is not a good movie, and it goes flat even pictorially, and it short-changes the actual carnage of WWI, and no child should have to watch the horse in pain and panic. Of course, the movie never mentions that most of the British horses that survived awful service in the military were then shipped off to French meat packers and glue factories. The commercial piety of a feel-good finish is respected. Spielberg helped define those pieties.